Yesterday I visited a wonderful place, the Pueblo Grande Museum at 46th Street and Washington in Phoenix. I highly recommend it. You can, of course, just go there, but I'm not really much for museums. So my visit was different. Usually when people hear that I'm interested in Phoenix history, they want to take me museums, or make me look at history books. And yeah, I like to do a little bit of that, but what I'm looking for, and looking at, is a bigger picture. I'm not a researcher, I'm a time-traveler. I visited the archival area. 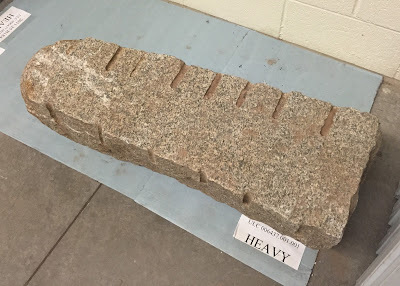 They have a granite hitching post that had been found buried under the street at the intersection of Jefferson and 1st Avenue during construction of the light rail in 2006. Of course, it's historic (from territorial times) not Hohokam, so I had no idea that Pueblo Grande would have any interest in it. I was amazed, and pleased, to see that they do care. Of course, there's no way to precisely date the hitching post, but it's been over 100 years since anyone hitched a horse in downtown Phoenix, at Jefferson and 1st Avenue. It has a rounded top and a hole drilled into it, which I learned is where there was a ring for tying the reigns of a horse. I found a lot of images that look like it on the internet, but I really know nothing about horses. The rock is exactly three feet long. The grooves cut along the side still puzzle me. At first I thought that it was so it could be a fence post, but they're on two edges, and there's spaced in a strange way. So I'm still puzzled. It's a fun puzzle. And I got to touch a piece of Phoenix history, even if it's just an old rock. If you're a time traveler, like me, you understand. Otherwise it's just an old rock. This isn't the kind of thing that's displayed with velvet ropes around it, and it really doesn't have a value on eBay. But it's priceless, and when you time-travel to downtown Phoenix in territorial days, and hitch your horse to it, it's amazing. Thank you, Pueblo Grande Museum! The Pueblo Grande Museum posted your article on fb. Great insight Brad.